After much consideration, you finally decided to buy a beautiful jewelry box for that special someone. This is a great choice for a woman’s birthday, anniversary, or wedding gift since women love jewelry, but remember the goal is to purchase a storage box that will accommodate the type and size of jewelry worn while keeping each piece safe and protected. The challenge is in choosing a high quality storage box within the budget but also finding the best style and design according to the receiver’s taste. To help, we listed some tips on buying a jewelry box that will meet or exceed expectations. Every woman has a distinct style in clothes, shoes, handbags, jewelry, and even hairstyle. 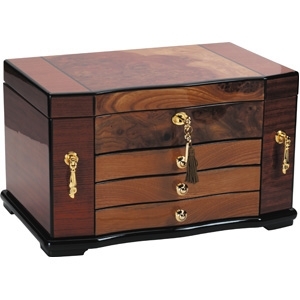 In order to buy the perfect jewelry box, you want to start by considering the recipient’s personal preferences. 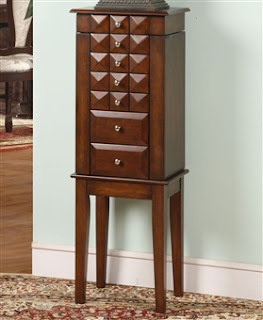 For instance, if she likes things that are big and bold, perhaps an ornate floor jewelry armoire would work best. On the other hand, if she prefers more simplistic things and clean spaces, a smaller yet sophisticated dresser top storage box would probably be a better choice. Again, you want to think about the types and sizes of jewelry pieces that she wears. If she has oversized necklaces, multi-stone cocktail rings, and/or chandelier type earrings, the storage box needs to be able to accommodate. In this case, it would be important to look for full-size swing-out necklace side doors, ring roles, and large compartmentalized drawers. Something else you should think about is the way in which the jewelry box would be used. In other words, if she wears jewelry to work or while out on the town, you want to consider conventional storage boxes whereas if she travels for business or takes frequent vacations, a travel jewelry box would be ideal. In addition, if she wears very little or smaller jewelry items, a simple yet stunning trinket box would also make a great birthday, anniversary, or wedding day gift. Obviously, any jewelry box being considered should have excellent workmanship or craftsmanship. A misconception is that quality is expensive. While it can be, this is not a hard and fast rule. In truth, there are many gorgeous and affordable jewelry boxes of the highest caliber workmanship and materials available. The key is to buy from a reputable source, one known for selling only the finest but also most affordable items. On a side note, while workmanship is important regardless of materials used, this would be particular important when purchasing a jewelry box made from exotic wood. Choosing a jewelry box that features lock and key is imperative, especially for more expensive jewelry pieces. While some criminals will not be deterred, a locking storage box would certainly make someone think twice. In addition, if she wears silver jewelry, we recommend choosing a jewelry box with anti-tarnish suede lining. As part of the buying process, we also strongly recommend that you choose a company that provides a guarantee on every jewelry box sold, regardless of style, size, materials, or price. This means if the item were to arrive broken or with a defect, or if the storage box broke prematurely or within a set number of days determined by the company, a full refund would be offered or you could make an even exchange. Regardless of the jewelry box selected, a guarantee provides peace of mind.